Have you ever had a student who just cannot seem to get the rhythm right in any of their pieces? Join me for today’s podcast and I’ll talk you through some strategies to help these struggling students. Hey beautiful teachers before we get going here I want to remind you that I actually just did a webinar. If you’re listening to this as soon as it goes live or shortly afterwards the webinar about rhythm improving your student’s rhythm. In just a few minutes of lesson time. That was on this afternoon. And if you sign up right now it means you can still get the replay. So if you want to sign up for that go to vibrantmusicteaching.com/rhythm who that’s the number two vibrant music teaching dot.com slash rhythm too and do that as soon as possible if you want to catch that replay. Otherwise of course if you’re a VMT member you can just catch that inside the library very shortly. And I hope you enjoy it. Now onto today’s topic we’re talking about students who really really struggle with rhythm. I’m sure you’ve had this student tried to picture them in your head. They’ve been with you for maybe a year maybe more maybe several years. And rhythm is just this huge issue for them. They just do not get it. It doesn’t work. You’ve tried everything with this student. You’ve tried explaining it in different ways and practicing it in different ways. But still they come back week after week with rhythm pieces that just lack any sense of rhythm any consistent beat behind it. These students can play something twice completely differently each time and not really be aware that they’ve even done it. Maybe they can repeat directly after you if you play the rhythm for them correctly maybe they can copy it back to you but then they go home and practice it. And it’s the same story next week. It’s all inconsistent. It’s all changed again and you just don’t know what to do with them. Perhaps they even can’t find the beat in a piece of music. If you’re listening to it maybe they can’t tap along even though they’re at an age where most kids will be able to do that. So if you have a student like that in your studio or if you’ve had one in the past and you want to one and know what you can do the next time one comes along then I’ve got you covered with this episode and I hope it will help you because this is one of those things that is just so frustrating when you come across it. If you’ve had a student like this I’m sure you’ve been tearing your hair out. It is so hard to deal with because you just feel like it’s Groundhog Day each and every week and they are not getting it and you don’t know what to do. And yet you don’t want to give up on them do you. Because they are trying. Any student who is trying I feel needs our help but it is really hard to deal with this when nothing seems to be sticking. So we have to fix the rhythm because rhythm is so important. As I talked about in last week’s episode Episode 28 rhythm is essential to a great playing but telling them about it just will not work. So I’m giving give you a few different strategies here. 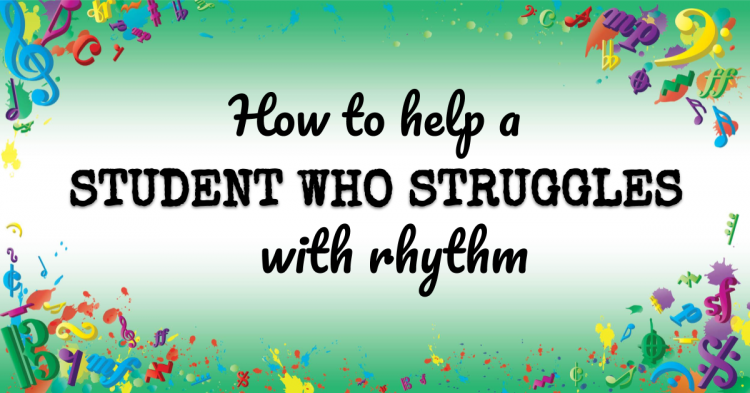 They all come down to one thing and if you go remember this one thing as we go forward you’re going to be so much better off when it comes to dealing with these students who really struggle with rhythm. And that’s what you should put rhythm first. That’s ending gradually simple. But if you keep it in mind you’re going to get what I mean in just a moment. So first of all do the rhythm before you start each and every piece with this student make it a rule you must not start a piece without doing the rhythm first ever again. I’m serious. Every single one. So the next time you open up a piece with this student. If you’re not doing this already the rhythm should be the first thing you do. And what do you do with it will vary from piece to piece. You can try a lot of different things. So you can count it and clap it. You can tap it out with both hands to get the coordination right. You can try it on a drum. You can try having them count while you play and you can try all sorts of things. But the main thing is just to do rhythm first. This does a couple of things. It makes sure that they understand the rhythm from the get go or that they’ve had at least some experience with it. If they’re really having trouble understanding it they might not get it but at least they’ve experienced it. But it also tells them it sends this message that rhythm is the most important you know how lots of students lots of students out dynamics. Often that’s because we leave the dynamics to last. They get the least practice with the dynamics or the articulation or whatever thing we leave to last to focus on. Right. We get it up to this certain stage of the piece up to the certain stage and then we say OK now it’s time to add the dynamic. And so they forget about those the most because we do them last. So it’s about priorities. If rhythm is your priority make that clear. Do it. The first thing with every piece and then make it the first thing you do with every piece they are practicing in an ad side of the lesson. So not just new pieces every time they play any piece you do the rhythm first no matter how long they’ve been doing it. They have to clap or tap or drum or March or I don’t know. Jumping Jack the rhythm before they play every time. If you make this a habit in their lesson it will start to carry through at home. If you just keep at it though you have to keep doing it. And of course involve the parents if they’re a young student and emphasize that they should be the first thing they do with every piece from now on they must insert action here. This piece before they play it each and every time. If they don’t have time to do that they don’t have time to play it. So rhythm first with new pieces rhythm first with old pieces. The next is to put rhythm first in your lesson. So doing a rhythm warm up as the first thing of every lesson. This again is about showing your priorities to the student. Rhythm is the most important especially for this student. And you’re going to start the lesson with it. It also means that you never miss this step because we’re all busy. 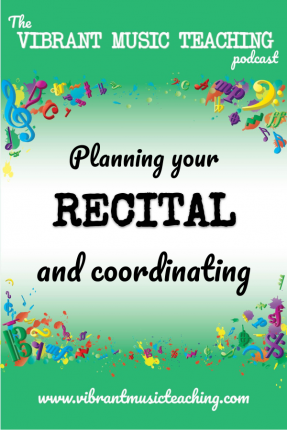 OK we have a lot of stuff to get through in the lesson and once you get going on it it’s going to be tempting to stay at the piano and drill it these things over and over until they get it but that’s not laying down the foundations for them improving their rhythm in the long term. All that’s doing is dealing with the urgent issue not the important one. So make rhythm warmups the first thing you do in your lesson if you need ideas for rhythm warmups. My brand new book rhythm in five is out now on Amazon you can get to it vibrantmusicteaching.com/R5 or you can just search Amazon for rhythm in five and it should pop up or search for my name even Nicola Cantan. So there’s loads of activities in there you won’t be stuck for ideas is 25 different things and there’s tons of variations within each one so that you can do a rhythm warm up at the start of each and every lesson and have fun and interact with it and not be pointing out or badgering students about rhythm or counting along with them or doing things that feel like nagging I’m sorry they kind of do instead you can be playing games and working on rhythm together in a way that’s actually enjoyable. And the next thing you can do with those rhythm warmups as well is to use them as a brain break. So anytime your student is practicing a piece over and over or playing the same thing or getting stuck on something it’s just not working. You’re not getting very far. Again it’s tempting to just stick at it. You just stay there and do it again and again until they get it but that’s actually not the most productive solution as we know from our own practice. You get stuck on something right and you just force yourself to play it again and again and again. What does that do. I don’t know about you but for me it just makes me angry at it and I get nowhere. Whereas if I just step aside and say what’s the problem here and think about it and try a different approach that’s going to get better results. So the same is true with your students any time they’re getting stuck on something. Sometimes they just need a break for a second. And the rhythm warm ups again are a great way to do that. So you can get up march through the room and work on rhythm and then sit back down and they’ll actually probably get more done in the lesson not less because you spent those three to five minutes marching round or doing whatever you’re doing to work on the rhythm. So that’s it. This is a brief episode this week just to encourage you to try to put rhythm first with these students and mostly just a friendly word. Keep at it because I have had many students like this who I just thought this student is just never going to get rhythm it is so hard I am banging my head up against a wall and we’re getting nowhere. And then after a while it did click. It did fit together put rhythm first in every lesson play lots of duets play in unison with them if they are not ready for a different duet part yet I just keep at it keep focusing on it don’t point out to them that rhythm is such a problem. Just do show it in your action show that it is a priority and that you are putting it first and do that with every piece every time do it first in every lesson and you will get there. It might take years but you will get there. It is possible. So next week I’m going to be taking you through three rhythm warm ups from my new book that’s rhythm and five and that is going to I’m going to walk you through those warm ups and it’ll be valuable even if you have the book because I’ll give you some more information on the ideas behind them and explain them in different ways. So I’ll take you through those next week grab the book. Now if you don’t have it already on Amazon and you can catch the show notes for this episode with all the links at vibrantmusicteaching.com/29. That’s 2 9 and you can catch that webinar if you act really fast. So sign up at vibrantmusicteaching.com or colourfulkeys.ie and you can catch the replay of that webinar from today. So in the meantime go forth but rhythm first and I hope you have great success with your struggling students when it comes to rhythm. I’ll chat to you next week. Bye for now. If you’re interested in improving your student’s rhythm you can get that book rhythm in five. Right now on Amazon. Members of vibrant music teaching can also catch the full course where I talk you through and explain fully each and every exercise that you’re really confident doing them in your lessons. So if you’re not a member go to VMT.ninja and sign up and you can get instant access to the full rhythm and five course and the PDA version of the book. The above audio transcript of “VMT 29_How to help a student who struggles with rhythm.mp3” was transcribed by the best audio transcription service called Sonix. If you have to convert audio to text in 2019, then you should try Sonix. Transcribing audio files is painful. Sonix makes it fast, easy, and affordable. I love using Sonix to transcribe my audio files.